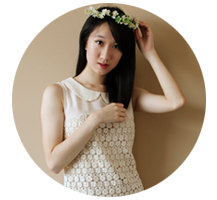 REVIEW: Be Discovered for a Brighter, Whiter Smile! 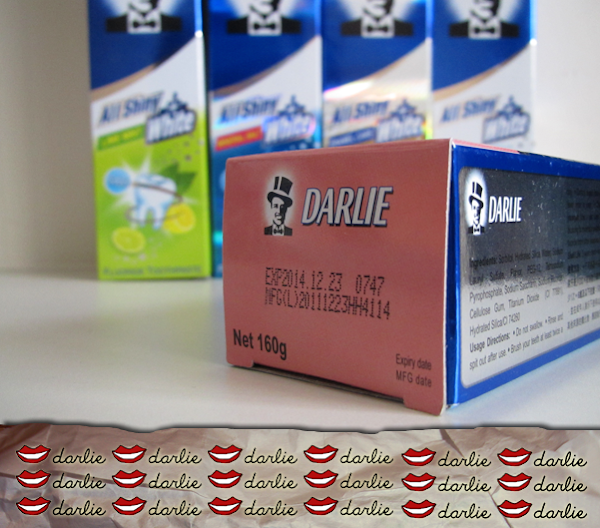 Earlier this month, I received 5 tubes of Darlie's All Shiny White Fluoride Toothpaste! For someone who brushes her teeth at least 3 times a day, these 5 tubes are as delightful as makeup! Heh. Smiles can turn our upside down world the right side up, even when they are from strangers! However, because of the food and beverages that we take, sometimes our smiles are dulled. This is but a peripheral problem. A more serious problem occurs when our tooth erodes. Tooth erosion affects the entire surface of the tooth and can cause your enamel to thin. The enamel covers the surface of the tooth crown, helps to absorb pressure from biting and chewing and protects the tooth's inner structure. When the enamel wears down, the sensitive dentine is exposed, leading to an increased in teeth's sensitivity to hot, cold or sweet food and drinks. And this is the point when Mr. Darlie saves the day!!! 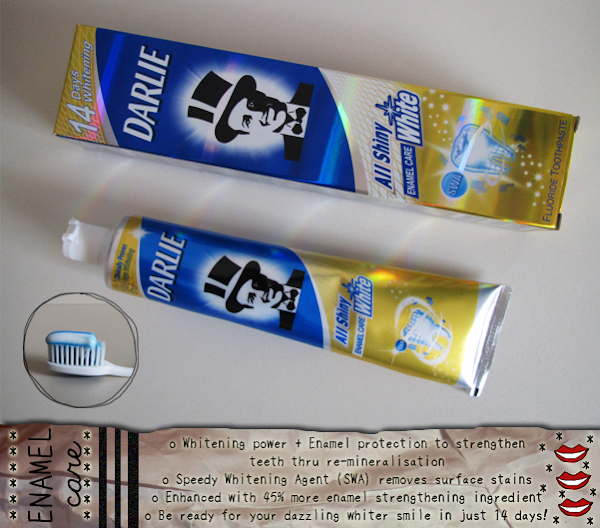 Darlie's All Shiny White Enamel Care Fluoride Toothpaste is formulated to provide both whitening power and enamel protection to strengthen teeth through re-mineralization and restoration of surface smoothness. The 50 million Speed Whitening Agent (SWA) molecules work hard to remove stains effectively. It also contains 45% more enamel strengthening ingredient (Than the regular one.) 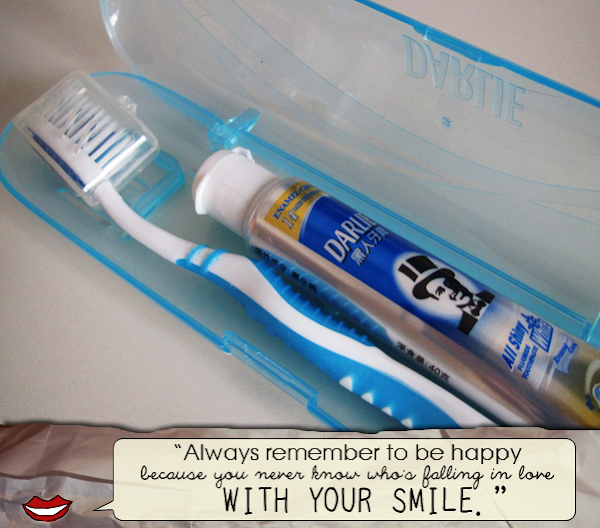 so be ready for your brighter, whitier and healthier smile in just 14 days! One tip for maintaining a white and healthier smile is to rinse your mouth after every meal! The other toothpaste which I have used is the Apple Mint one. I don't quite like apples but I like apple-flavoured stuff! They smell/ taste very fresh, but without the acidity that apples sometimes come with. Needless to say, I LOVE THIS!!! 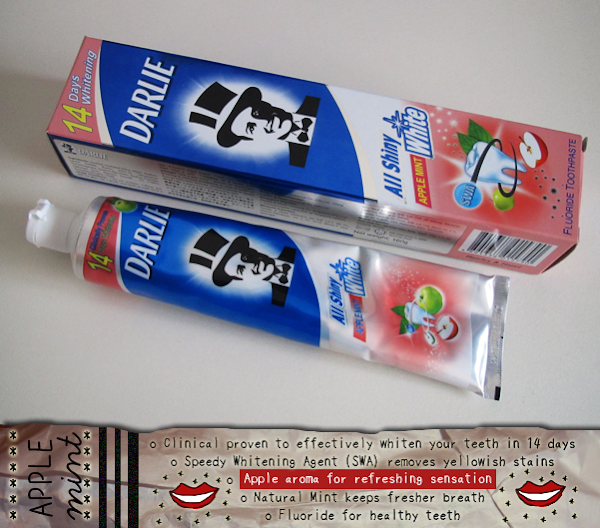 Darlie's All Shiny White Fluoride Toothpaste comes in 5 different types; Apple Mint, Lime Mint, Mineral Salt, Enamel Care and the regular one. They are available at all supermarkets, hypermarkets and medical pharmacies at retail price of $3.15. 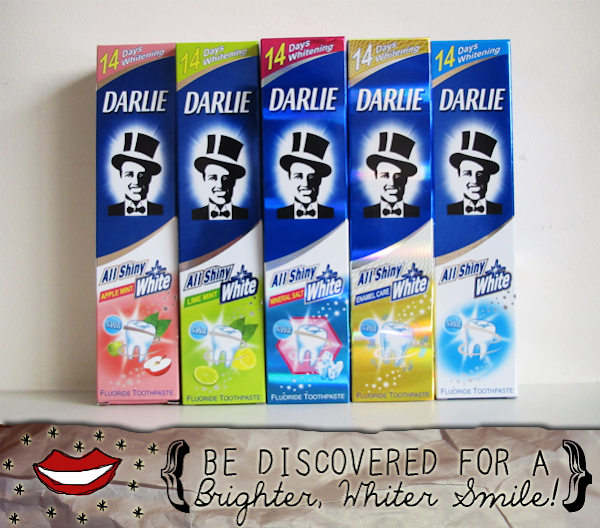 This April, do keep a look out for Darlie's All Shiny White's 'Be Discovered' campaign! It is an integrated communications program that will showcase a new and captivating television commercial and out-of-home displays!